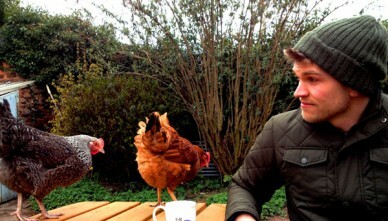 Poultry keeper James Marshall will often be found writing about farming and the countryside on his blog Outdoorsandmore. Here, he takes time out to make a light-hearted, but nevertheless identifiable, comparison between what some of the more romantic guides will tell you and his own experiences. Any prospective chicken keepers; take note! It may not be quite as straight forward as some authors would have you believe. Theory: Awake with plenty of time before work and head outdoors. 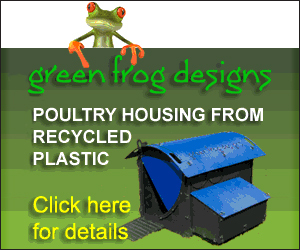 Carefully top-up the chickens’ feed hoppers with layers pellets and replenish their water supply. Proceed to release the chickens from their house by slowly opening the pop hole – thus allowing your birds to emerge peacefully and greet the new day. Make sure to pick up the lovely fresh eggs that your girls will have laid in their nice, warm nest box. Open up the run and watch the chickens roam free; taking note of the satisfying, grateful clucks. Then stand in the sun, cup of tea in hand and survey the gentle pottering of your beautiful birds. Reality: Swear profusely at the alarm clock as it dares to wake you ten minutes earlier than usual. In doing so, disturb and irritate your wife. Attempt to fill hoppers with feed whilst simultaneously trying to make a cup of tea in the kitchen. Spend the next five minutes brushing layers pellets off the visible sections of the floor, under the fridge, when this multitasking invariably fails. Make sure to spill water over your crotch whilst topping up the chicken’s water, thus assuming the appearance of an individual with very limited bladder control. When opening the pop hole of the chicken house, take a moment to marvel at the general level of noisy argy-bargy that occurs as your ‘placid’ birds jostle to get outside and commence stuffing their faces with feed. Go to collect eggs and sigh as you are yet again faced with an empty nest box. Proceed to shake your fist at your flock whilst simultaneously muttering one of these phrases: ‘useless’, ‘waste of money’, or ‘ I don’t like eggs anyway’. Take a few minutes jogging on the spot to stay warm, with the knowledge that your neighbours are laughing at the idiot stood outside in his pyjamas, wearing wellies and talking to birds. Theory: Come home from work and check that the chickens are all OK.
Maybe relocate the run to a new position to help save the lawn from too much wear and tear and perhaps give a few bits of corn to the birds as a treat. 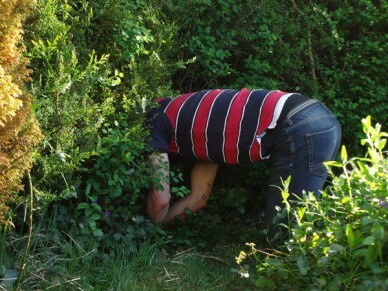 Reality: Come home from work and chase the chickens out of the hedge, vegetable patch or next doors garden. Spend the next few minutes scouring various locations to see if the chickens have decided to lay eggs in any ‘adventurous’ locations during your absence. The greenhouse and prickly hedges are a good bet. Attempt to move the run, but reconsider when the mass hysteria that this causes amongst your nearby birds sets in. Get slightly freaked out as the chickens follow you with greedy, glazed eyes as you approach with a tub of mealworms in the greenhouse and try your best not to think of The Birds as you watch them demonically devour the dried out critters. Theory: After a splendid evening in front of a cosy fire reading The Times and having had a hearty, egg based meal, proceed outdoors as the light starts to fade. The chooks will now be tucked up in their hen house, ready for bed, after a thoroughly tiring day of general chicken-ness. Simply close the pop hole, shut the run door and head for bed. Reality: After a stressful evening of cooking, cleaning, article writing and job applications, trip over boots by the back door and troop outside. Proceed to fall over a strategically left hose pipe or garden fork in the dark. Place your hand on the latch of the pop hole and then curse as one chicken jumps out of the hen house to say ‘hello’. Have a fun few minutes attempting to corral the bird back into the house and – just as you give up doing so – watch as she casually heads back indoors. Attempt to close up the run and in doing so catch a piece of your clothing or finger in the locking mechanism. Shake your head, have a little laugh at yourself and then head indoors; another day of real life chicken keeping completed.